It’s the most tragic event of his life, but Travis Hamonic has built the experience of his late father’s passing into his daily routine. He’s learned to draw strength and inspiration from the memory, and now he’s helping others who have gone through similar circumstances do the same. 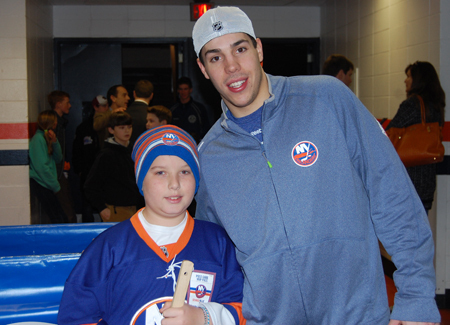 During every Islanders game at Nassau Coliseum, the defenseman invites a young fan who has lost a parent or loved one to be his “D-partner of the game.” The Islanders partner with local bereavement groups such as Tuesday’s Children and the New York Police and Fire Widows and Orphans Foundation to select Hamonic’s guest for each game. The D-partner gets special VIP treatment for the night, including the chance to high five the players as they go on the ice and the chance to sit in Hamonic’s personal seats for the game. After the game, Hamonic invites his new line-mate to the Islanders dressing room to hang with other Islanders players, take pictures and collect autographs. The youngest of four growing up on the family farm in St. Malo, MB, Hamonic was 10 years old when his father lost his life to a sudden heart attack. Years later, the memory of what Hamonic calls “the most difficult thing I’ve had to go through” is still fresh in his mind. Although hockey was always big in the Hamonic family, there was no NHL team in nearby Winnipeg at the time. Most years, the closest the city got to NHL action was an annual preseason tilt between two big-league clubs. Just a few weeks after his father’s death, Hamonic and his mother attended an exhibition game between Edmonton and Vancouver, which proved therapeutic. The game soon became a tradition, as well as a source of healing for the Hamonics. For Hamonic, the local rink became a haven, helping him persevere through his loss. Not all of Hamonic’s D-partners are avid hockey fans, but most of them already appreciate the role sports can play in the healing process. No two of Hamonic’s D-partners have the same story. They’ve all experienced different circumstances; some have large families, others small. Some lost a parent recently, while for others, the loss was years ago. 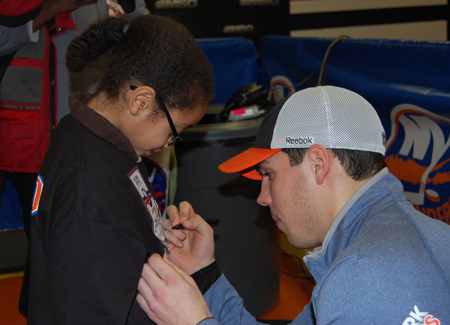 Hamonic learns each child’s story first hand, taking time to exchange memories and even old photos throughout the locker room tour. Hamonic’s mother, three siblings and many more in the community pitched in to fill the void that was left in his life. Looking back, he has a profound appreciation for those who stepped up for support. That’s a message he wants his D-partner of the game to understand. The 22-year-old still makes his dad a part of his pre-game routine every time he takes the ice. Hamonic doesn’t try to forget the past – he embraces it. He proudly wears several tattoos as a memorial to his dad, including one on his left bicep of the family farm in St. Malo and one on his right forearm bearing his father's signature. In a way, Hamonic re-lives the biggest challenge he ever conquered after every home game with his D-partners and their families. He doesn’t hide from what happened – the stories are real, just as they are for each of his guests.